Made from images as small as wallet-size, PhotoThrowTM combines the art of photography and knitting. The result is a soft, lush, throw made from heavy-weight Cotton blended yarn. 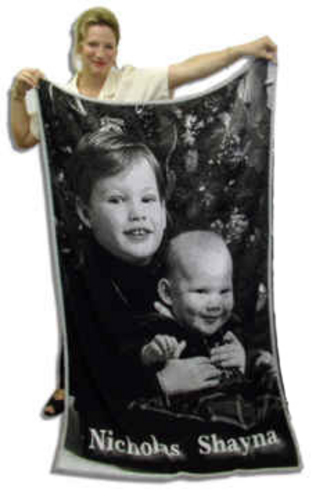 The image is knitted into the throw, not printed or heat transferred. It is a unique and breath-taking product in classic black/white tones. 8) if you have a coupon and it does not take, then complete the order and choose pay by mail/fax and someone will contact you to review the order if necessary. 9) Once we verify the code you will be given full credit. Images can be potrait or landscape.